The Czech Republic is located in the central part of Europe, hence it is often called "The Heart of Europe". The country has a population of about ten million. It came into existence in 1992 when Czechoslovakia was divided into two independent nations, the Czech Republic and the Slovak Republic. 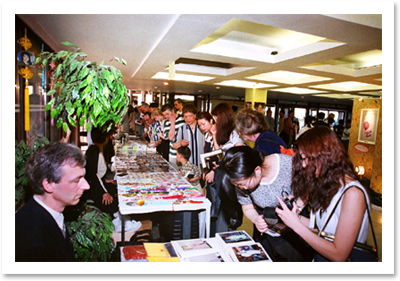 Master's lecture was given in the capital city of Prague, and attracted about 1,500 listeners. The main lecture hall was packed, and many guests had to see Her speak on large screens in two smaller halls. Master entered the lecture hall dressed in a white outfit and wearing a simple hairstyle. She smiled and put Her palms together in greeting, giving an impression of peace and harmony. The message that Master delivered to the audience was clear and powerful: "We are the children of God. We must reclaim this glory." "Every one of us can see God in this lifetime and see God right away. As soon as we want it, we will see Hirm, only if we know how." "God always sends someone to us who is directly from Hirm, or ordered by Hirm or empowered by Hirm, in order to show us the way." Many guests learned about the lecture during a book exhibition held the preceding week. Some learned about the event from posters that appeared almost everywhere in downtown Prague. Others had learned about Master as far back as 1993, when sample booklets were first published and distributed in Czech. They immediately recognized Master on the posters and wanted to see Her in person. 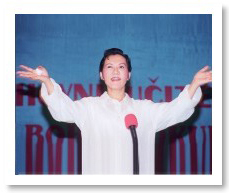 Before the lecture started, many people came to inquire about initiation and after the lecture, several hundred were initiated into the Quan Yin Method or learned the Convenient Method of Meditation. When the initiation was in progress, Master briefly visited the book exhibition hall several times. The working staff immediately gathered around Her. A citizen over seventy years of age, who had requested initiation into the Convenient Method, tried to make his way into the crowd while holding high a sample booklet to prevent it from being crumpled. 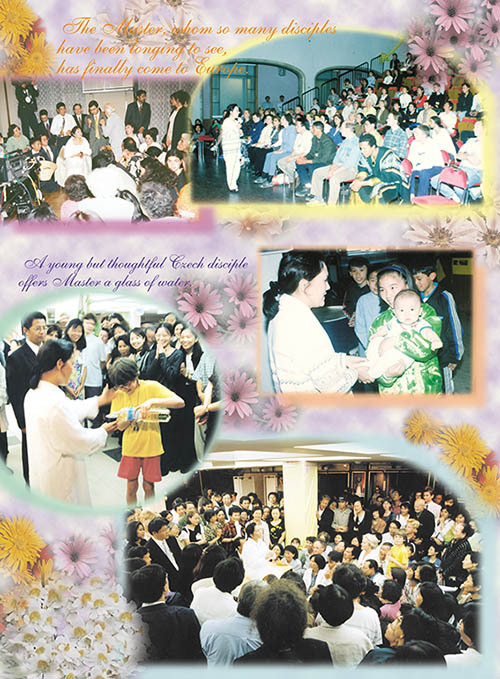 Master asked the initiates to bring the booklet to Her and when She signed it, everyone cheered for the elderly brother. A ten-year-old half-initiate came forward to offer Master a glass of water. Master took a sip and sprinkled the rest of the water on the people around Her. 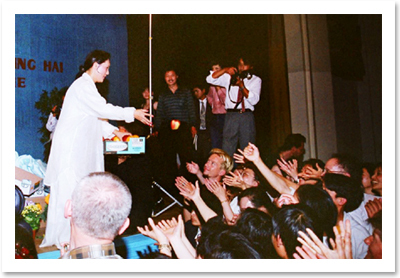 Her blessings delighted everyone present. Two days later, this young girl received an unexpected surprise - a big package of Master's books and children's story books. This was a thank-you gift from Master for her love and concern. The child was elated.